I am a wee bit groggy this morning as I type this, and I had troubles with turning off my alarm too as my hand was asleep. I hope this is not a prediction to the rest of my day :). 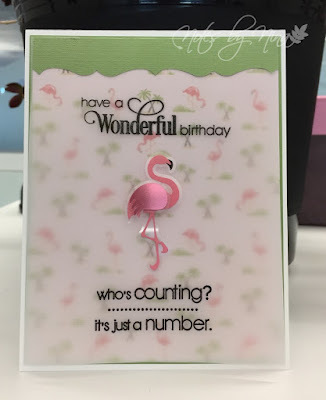 This simple layered card was easy to put together, I futzed with the elements for a long time though. I have some of the panels layered with foam tape and I heat embossed the sentiment and popped it up as well. The hat, badge and cuffs are stickers. Supplies: White and black cardstock, Designer Paper - Carta Bella, Technique Tuesday - Say it Happy, Jolee's Boutique, SSS stitched die cuts. I love this super fun paper, I stole it from my sister. Although it is not really thief when she knows about it and encouraged it :). Why I thought mushrooms and this sentiment looked good together is anyone's guess, but I still like it. Layers.. of course. The strip to separate the top and bottom is embossed for a little texture. I popped the sentiment up with foam tape. 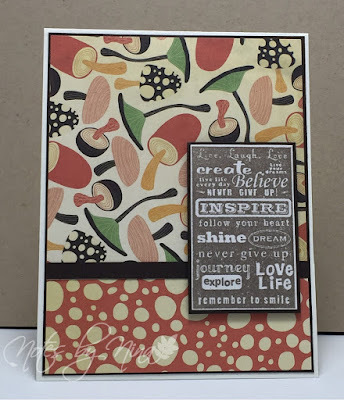 What I wish I had my hands on when I stamped this sentiment, my Misti. It would have definitely cleared up the image a bit. I have this little cheat sheet for the supplies I used so when I got around to blogging them I would have the deets. I have FSC for the designer paper makers, I love my own acronyms and I have no idea what that means. 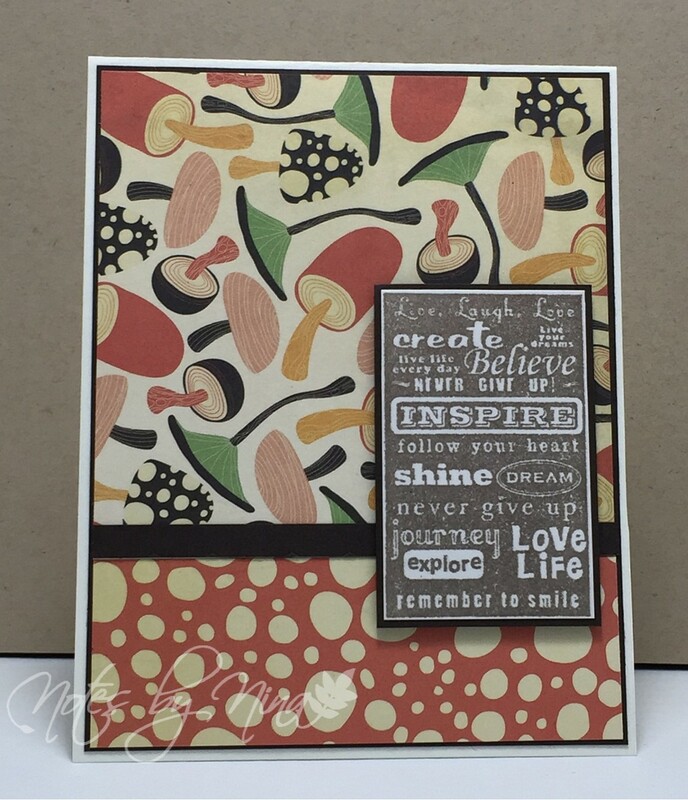 Supplies: Cream and brown card stock, Designer Paper - Unknown, Inkadinkado - Inspire. I had a little time this weekend to put together a card or two. 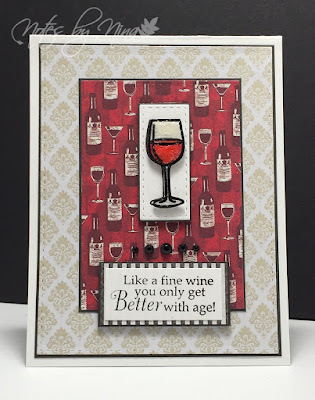 I heat embossed the wine glass then coloured it before fussy cutting it out and adding a thick layer of Glossy Accents. The rest of the card is lots of layers and foam tape. I finished with a small row of gems. Supplies: White and black card stock, Designer Paper - Wild Rose, Fiskars - Aged to Perfection, gems. This card was nice and quick to create, I used simple layers. Cardstock, DP then vellum. 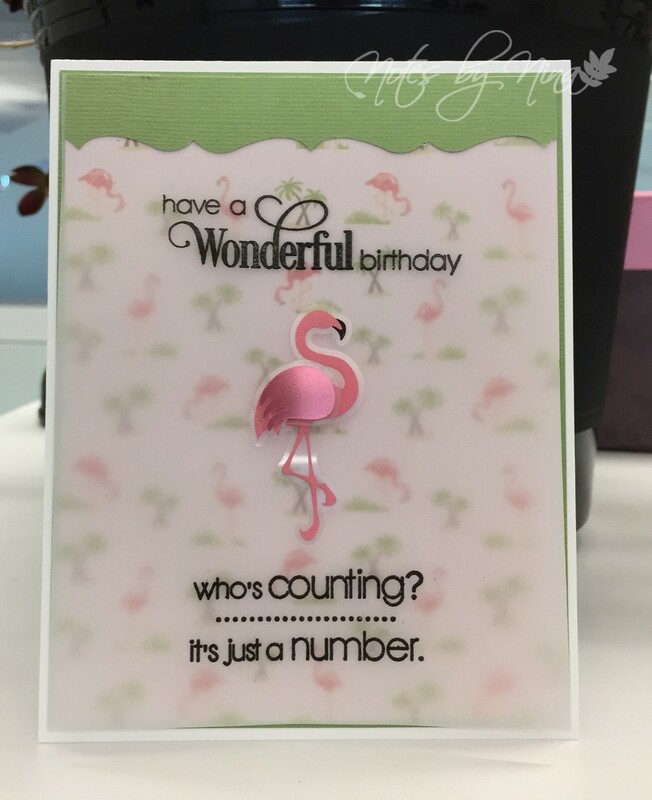 I heat embossed the sentiment on the vellum then added the cute flamingo. 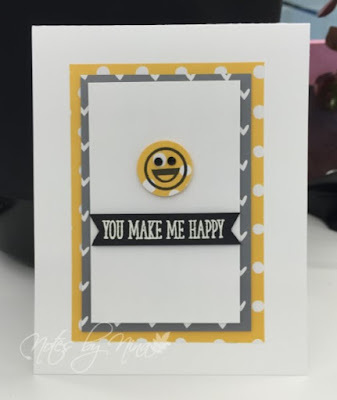 Supplies: White and green card stock, Designer Paper - Carta Bella, vellum, Penny Black - Sprinkles and Smiles. I had a vision of a standup craft desk, a guy at work know lots of "guys". 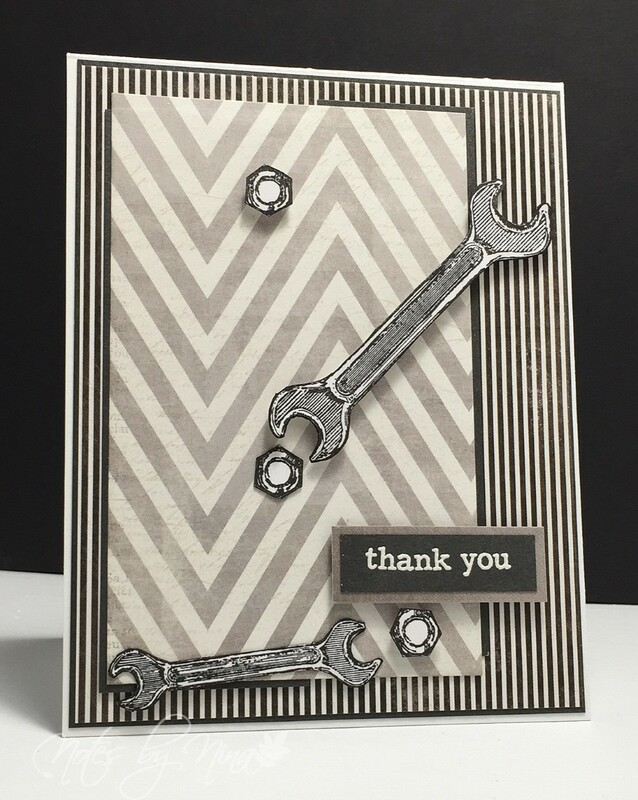 You know those handy peeps that fix or make things, and once you have a 'guy' or 'gal' they are treasured. Anyway, he had a 'guy' that was a cabinet maker. I don't have a dreamy craft room like some of the ones you see in YouTube videos but it is my fabulous craftroom... anyhow he was going to get me in touch to build my table. Unfortunately the 'guy' was elusive but it worked in my favour. I found a table that I can raise and lower, sit or stand that fit my needs to a T. Thank you IKEA. The guy at work put in a lot of time to draft up a table with all the dimensions so this card is for him and I have a bag of cookies with his name on them. 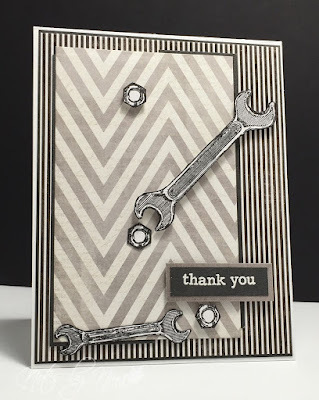 Not much of a Thank you but..
Supplies: White and gray card stock, Designer Paper - My Mind's Eye, Clearly Besotted - Sentimental Type, Forever in Time - Tools. A another short post before I head off to work. I love layers... in case you have not noticed.. and my stitched die cuts. Both used here in spades :) and why not. 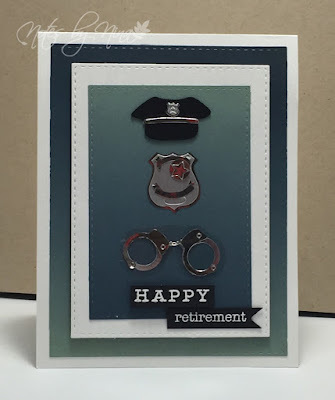 The sentiment is popped up with foam tape, and this pretty paper does most of the work. I used a small grey cardstock border then the flip side of the double sided paper for the larger background. 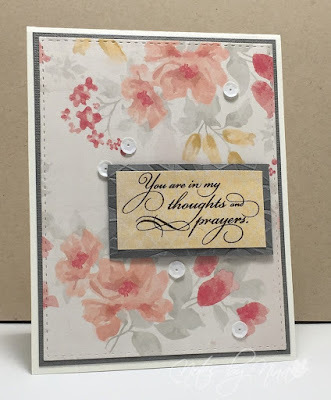 Supplies: White and gray card stock, Designer Paper - Kaiser Craft - Penny Black - Eloquence. A quick post today for a legacy card from my visit with my sister, yes I am still working on posting those :). I loved this beautiful soft paper, I added a thin gray matt. 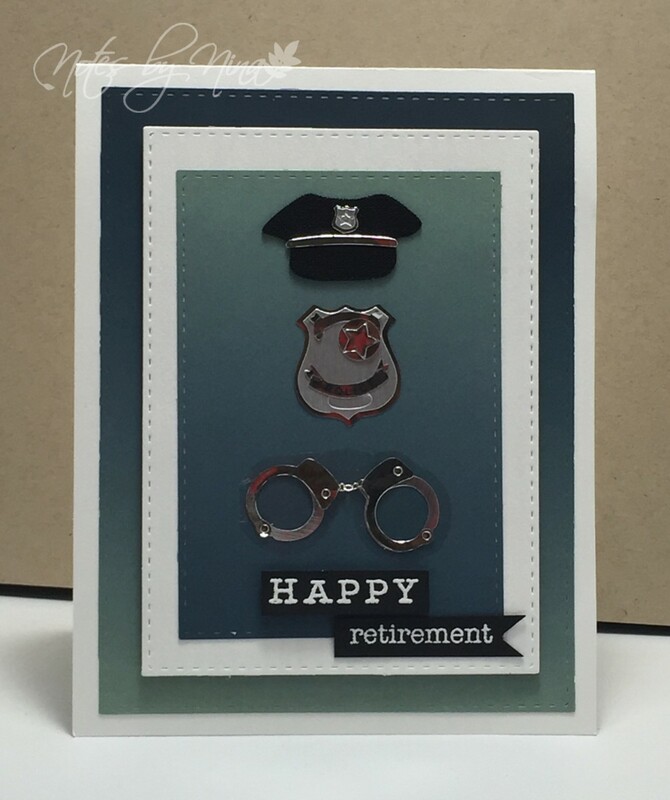 The sentiment is layered and popped up with foam tape. I finished with some white sequins. A little travel and a card.. I am back after another round of summer vacation, it has been harsh ;). This time we did a road trip through Washington state. My husband has taken the route a number of times on his motorbike and wanted to show me the pretty route. Mountains, desert, prairie and then mountains again, it was like hitting 4 provinces :) and I loved it. Needless to say there was not much done in the way of card making... the craft room makeover however is done. I have some small organizing items left but that's it. I have this stunning new ceiling light, there is not a single shadow in my room.. I might also have a permanent tan :). This is the card I was creating when "Bug" kicked the bucket, so I stuck with the simple layers. I heat embossed the sentiment then popped it up with foam tape. I stamped the smiley face then used a punch. I added some gems for the eyes and popped it up with foam tape as well. Sorry for the blur, not sure what happen there. Supplies: White card stock, Simon Says Stamps-Texting, Clearly Besotted - Sentimental type, Designer Paper - Lawn Fawn, gems.